These native insects of North America have been scanned and computer enhanced to create an accurate and beautiful image. 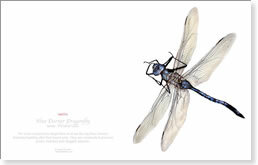 Insects are available in both cards and large-format archival prints. This project began 15 years ago after a prairie restoration on the artist's land in Michigan, and then later in upstate NY. The collection represents years of collecting insects which visited the restored landscape to nurture themselves on the native plants. It is the artist's wish to share the beauty and complexity of these often unnoticed creatures. Insect cards are available in packs of six in six different insect categories and as 11" X 14" prints. Buyers for retailers and museum gift shops, click on Wholesale link, or register to create an account. Store buyers can purchase cards individually in quantities of 25 (minimum), or as packs of six.